Can you airbrush Bill Gates on this T-Shirt? Interstate 77 south, heading home after work earlier this week. Snowy Ohio January afternoon. I’m skipping through the radio stations and stop for a moment at WNCX out of Cleveland. Though 98.5 does play a fair amount of modern-ish rock (in other words, songs written since I was in high school) it still hauls a Camaro-hatch load of classic rock. I don’t remember what song made me stop switching channels, but I heard it out, and then the drive-time jock, Michael Stanley, came on, spieling about how it was time for another 98.5 WNCX Cleveland’s Classic Rock Giveaway (or something like that – you know the drill), and a lucky caller was just minutes away from the afternoon’s prize. Be caller number 10, and you’d get yourself in the winner’s circle. The prize for one lucky listener of muffler-growling, Pink Floyd-fueled, Led Zeppelin-oiled, Rush-revving Cleveland’s Classic Rock? A brand-new copy of Microsoft Vista. So another cultural corner is turned. The wings are the Munny’s ears, colored with a silver Sharpie marker, and the pupils are blue permanent marker. 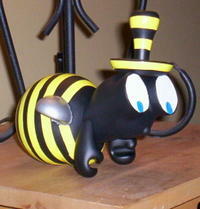 The stinger is the conical tip of the ray gun, with its stem poked into the bee’s body. Why did the mushroom become a hat? Because with no antennae and a plain black head, the bee just looked unfinished, and I think it helps balance out the big striped body. I considered drawing a mouth, but decided I like the way the figure’s shape suggests one versus actually putting one there myself, right beneath the bee’s nose bump, which is originally the Munny’s tail. Again, since the times when I do have an artistic vision usually lead to situations where my idea far surpasses my ability to make it real, I have to say I’m really happy with the way this little guy turned out. 1. Take five books off your bookshelf. To make things more random, I put the five books in a box and grabbed them blind, going with whichever one hit my hand first. The only time it didn’t work was with book four, which didn’t have 150 pages.